Faithfulness is a Fruit of the Spirit! Faithfulness is the “gluing” fruit that will preserve our faith and marriage. It is a prime character of the Holy Spirit flowing into and then out of us. It identifies God’s love and will so we can be dependable and trusting to God, in our marriage and one another in others. It is also the one fruit that we give back to God, whereas the others are flowing from the Holy Spirit working in us! Faithfulness is authenticity, the power and motivation for Christian marriage and living. Why and how? Because God is trustworthy with us we can be faith-worthy in Him and in our home! If not then, doubt, cynicism and distrust will flow. We will lose our trust and hope that God is in control! When we do this we will lose or miss out on God coming through with His promises and a working marriage that is triumphant. 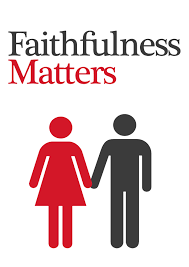 Faithfulness is very difficult to have or hold on too especially applying it to our marriage in today’s society and extremely rare in our other relationships. We tend to lose our patience with God, thinking He is just a blessing machine. In addition, when we do not get what we envision for our marriage we leave because of our uncertainty and pessimism. Yet, Faithfulness is the fruit that we give to God so He can sanctify, change us inside and out and be a change agent of example for our family! It is the ability to take what Christ has done in us and be a blessing into our family and then to others with loyalty and trust. Faithfulness goes against modern psychology and societies thinking, as it requires us to move beyond ourselves, whereas psychology tells us to be selfish putting the “me” first, rearranging the world to our needs, which creates self-destruction and a broken marriage. Faithfulness is more than just being faithful in our sexuality! We have to keep the goal of faithfulness in our minds always, as it will allow God to work deeper and us to respond to His call and our spouse! God has bigger things at stake that He wants you for, much more than the petty complaints we give or things we ask of Him! When we learn and apply the fruit and attitude of Faithfulness, then Christ is glorified; moreover, quality relationships are built and are kept! This happens best when we realize that Christ paid our debt in full! Therefore we can as Colossians 1:9-14 tells us, live a life worthy or as other translations state, walk worthy of the Lord. This means live in the manner of what we know and believe— and do it consistently. We do this when we are faithful in pursuing God and His righteousness, and believing His precepts, so He is more and we are less in our will. This is our “walk with God,” meaning living out the daily Christian life thinking as He has called, behaving as we believe, and thus doing in response to His Work in and for us. It is also being empowered by the Holy Spirit. It is never the walk in our own will and strength; such a thing is pride and disobedience to our loving Lord. So if you want a great tool to change and be an example of change, kept blameless or just improve our marriage, the Fruit of the Spirit, Faithfulness will be it! As we behave as the One we represent, as the name Christian means to be like Christ in His character. Refers to being an “appropriate” or acceptable offering so we “deserve” our reward—but we do not earn it (Lev. 26:3; Ezek. 36:27; Mark 10:29-31; John 3:30; Gal. 2:20-21; 5:16; Eph. 4:1; 5:1; Phil. 3:10-14). Then we can be Fully Pleasing Him, to be a friend of God with gratitude; seeking Him first is to glorify Him. (Deut. 10:17-19; 2 Chron. 20:7; Psalm 69:30-31; Matt. 5:16; 6:33; mark 12:29-30; 1 Thess. 2:4).